Happy Friday. We are excited to introduce you to Our Friday Friend Jen Tapler. We saw this yummy Chill-ax card in her SCS Gallery and just had to ask her to create something special for you here at the SASI Blog. She used Taylor's sketch today, TESC84, and gave it a little flip to feature the current TE charity set, The Places You'll Go. 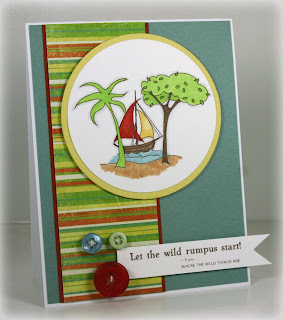 You can click on the card to see it larger and you get all the details on Jen's blog today - JenTapler Designs. But first let's learn a little about Jen. I live in Kahului - the heart of the beautiful island of Maui, Hawaii with my husband Joel and my 2 1/2 year-old son, Dean. I've been scrapbooking since before it was cool!! Then about 2 years ago I was at a local Holiday Craft Fair and saw some really cute hand-stamped cards and other little gifty items. I thought "hey, I could do that", went home and did some research online and in January 2008 I stamped my first image and created my first card!! I've been hooked ever since! I'm definitely a clean and simple kinda girl and I do love me some Kraft!! I love seeing how other stampers experiment with new techniques and glitzy products, but I find I get overwhelmed with all of that. I do my best work when I just stick with the basics. I'm still an avid scrapbooker, although now I mostly digi-scrap, but I love fusing these 2 hobbies and creating fun keepsake hybrid gifts and altered projects in addition to cards. Gosh, that's a tough one. I think my favorite SET has to be the new The Places You'll Go set. My father is in the late stages of Alzheimer's Disease and some of my fondest early childhood memories are of our nightly ritual of picking out a Dr. Seuss book and curling up together in bed and him reading me to sleep. My Mom saved my entire collection of Dr. Seuss books (from the late 70s!!) and I now read those same exact books to my son each night before bed. So yeah, those images and sentiments are pretty special to me! Thank you Jen for being Our Friday Friend!!! If you'd like to be considered for a feature spot here as Our Friday Friend simply upload your Taylored Expressions creations to the gallery at SCS using Keyword tayloredexpressions (all one word with no space.) We're always looking for our next Friday Friend. Thank YOU for having me!! What an honor!! Love love love your card Jen...along with everything else you make. Congrats! Yay Jen...Congrats!!! Your card is beautiful and I loved learning a little about you.